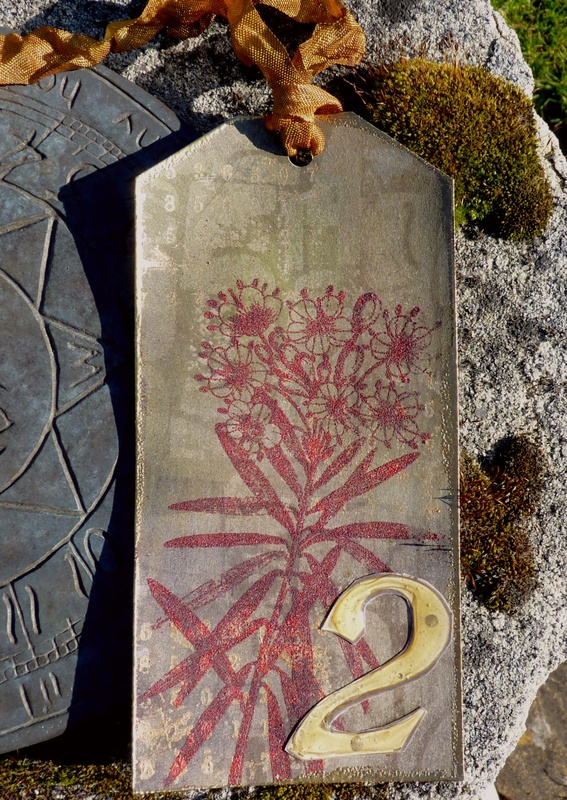 I haven't taken part in a challenge for a while now, lets face it, I hadn't done much stamping at all for a couple of weeks, but had a real good play this week so I'm having a go at Hel's Sunday Stampers challenge - numbers. Went for a tag, I do love tags, big enough to experiment but not too large to intimidate. Feeling grungy (well not personally, I did have a shower this morning) so got out the mucky looking inks and a few stamps. 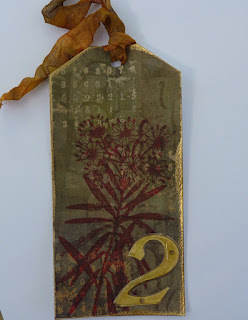 I love that numbers stamp so decided to use it with Picket Fence distress for a background and then swipe over with Moss and Walnut stain, stamp the little PaperArtsy numbers with gold dabber and then the big PA stamp is embossed with Fired Brick Distress EP. I told you it was grungy. The colour is true on this but you can hardly see the number background so I took it outside into the beautiful sunshine and took another photo of it lying on my, equally grungy, lichen and moss covered sundial. Luckily it didn't blow away...until afterwards. The sunshine distorts the colour but at least you get a better idea of the resist background. 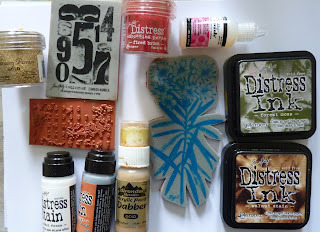 So a Sunday Stampers, simple tag - the letter 2 is cut out from a TH Distressables sheet and covered with Glossy Accents. While in the garden I took this photo of my gorgeous basket. It has been up there since last September and has flowered continuously since. 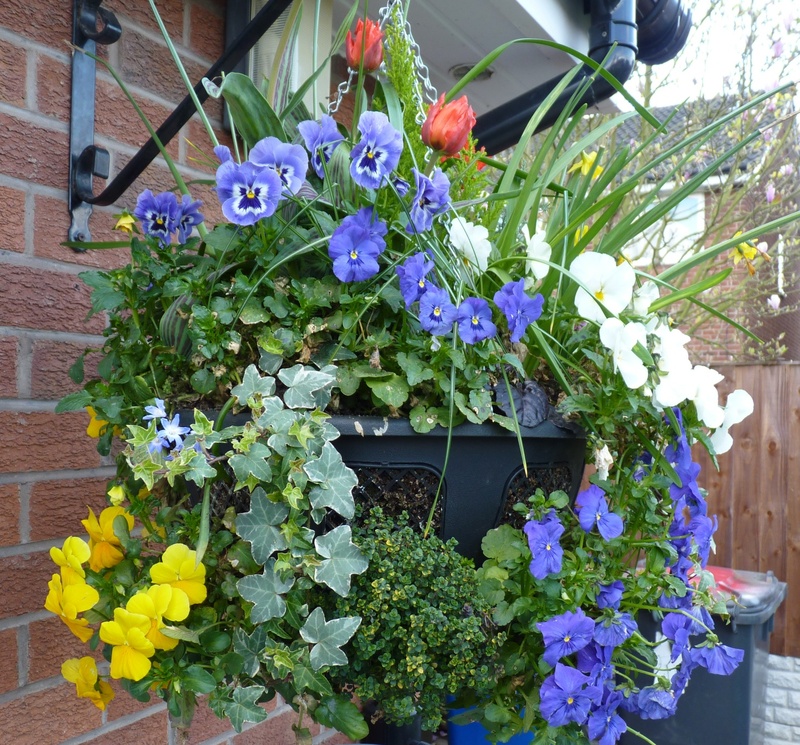 It had miniature daffs flowering last month and now tulips and the pansies, thyme and sage have kept going all through the winter, and it only cost me £25 pounds. Makes me smile just looking at it. Love the tag - it's interesting what taking photos in the sunlight does. Your hanging basket if beautiful. I love pansies and snapdragons. Ann, I love your grungy looking tag. Those are some of my favorite colors. Hope you had on your running shoes when you visited those 50 sites. Hi Ann. Great tag. The basket looks so pretty. Have a lovely weekend.